– Existing Ali`i Members with an active account must travel a minimum of 2 Round Trip Flights per month (4 segments) at a minimum. If you are requesting a new business account with Mokulele you must join our deposit on account program to enter the program. – If joining deposit on account program in addition to Small Business Program we will waive the necessary 2 flight minium as long as funds are available on the account at the time productivity reports are pulled. Account must have available funds. – Please be advised that in order to receive the listed benefits in the graphic above, you must be logged into your Ali`i Small Business account and the Small Business (Ali’i 1/ Biz1) fare must be booked. – Corporate Benefits and Segment credits will not be awarded to any bookings made outside of your Small Business Portal. Account status will be reviewed quarterly of each calendar year. 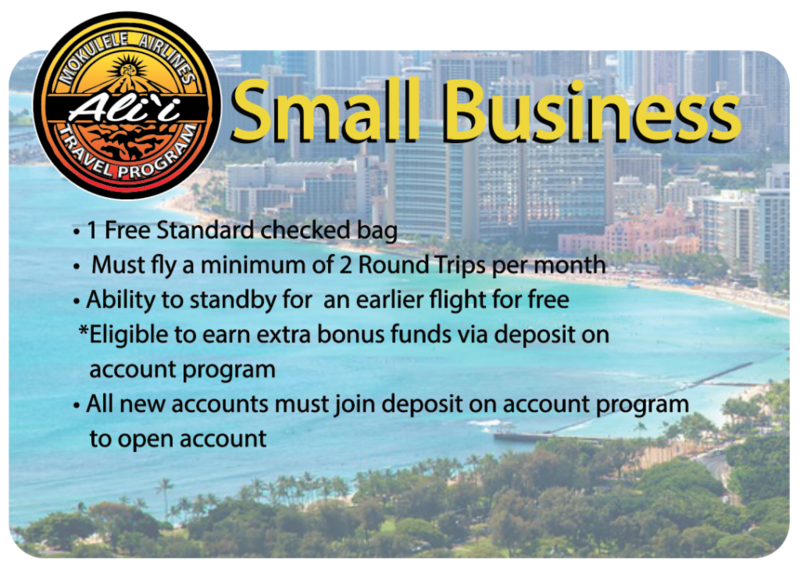 – Please Note: your company must travel a minimum of 4 segments each month to remain automatically qualified for the Mokulele Small Business Travel Program, this is monitored quarterly. – You MUST book the Ali’i1 fare in order to receive the above mentioned benefits. The Ali’i 1 fare can be found in the far right column of the flight selection screen. – If an Alii fare is not booked, normal bag & change fees will apply. – Sporting Equipment (ie: golf bags, surfboards, gun cases, bicycles, etc.) are EXEMPT from the baggage waiver. The normal baggage fee will apply. – It is the responsibility of the account holder to communicate all policies, procedures and subsequent fees to account users and travelers. Mokulele is not responsible for any users who book under your corporate account and are not aware of the current policies and/or fees. Please download and fax in this 2016 Corporate Application.